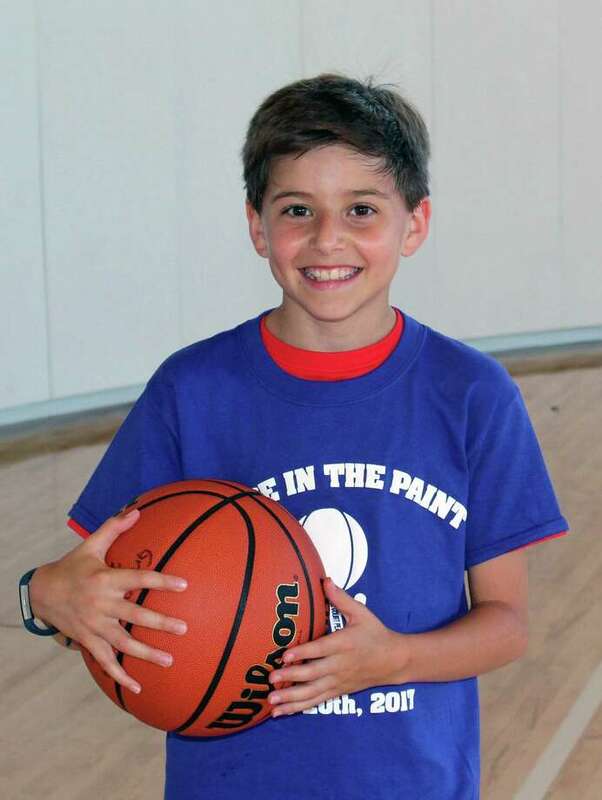 Cyrus Pearson , 11-year-old New Canaan Country School fifth grader who helped to organize Peace in the Paint. At Grace Farms in New Canaan, Conn., on June 20, 2017. NEW CANAAN — There was just a moment’s hesitation, right as introductions were being made, in Grace Farms’ River Building gymnasium on Tuesday afternoon. But as one basketball bounced, and then a second, tensions began to ease. By the time names were exchanged among the 12 participants, the short-lived, hesitant frowns were replaced with enthusiastic smiles on the faces of the New Canaan fifth-graders and the recent refugee children. “Kids are so much better at breaking down boundaries than adults. They don’t know until we tell them that they are any different,” said Mike Evans, founder of the Norwalk-based nonprofit Full Court Peace, which seeks to bring children from seemingly disparate backgrounds together through basketball. Evans partnered with the Grace Farms Foundation and Bridgeport’s International Institute of Connecticut (IICONN), a human services agency that serves new immigrants and refugees, to host Peace in the Paint in honor of World Refugee Day on June 20. Peace in the Paint — the name a reference to the painted area on a court from the basket to the free-throw line — brought together seven New Canaan fifth-graders, attendees of Saxe Middle School and New Canaan Country School and members of the town’s travel basketball team, and five recently resettled refugees from Afghanistan, Congo, Eritrea, Ethiopia and Syria who, between them, spoke Arabic, Swahili and Tigrinya. For Evans, the kind of linguistic cultural divide on the court Tuesday was par for the course. Through his organization, he’s worked to bring together Catholics and Protestants in Northern Ireland, Cubans and Americans, and low-income students and their more affluent neighbors in Fairfield County. At Grade Farms, the boys split into groups and practiced dribbling and passing drills, followed by shooting competitions and pick-up games. Claudia Connors, president and CEO of IICONN, stressed the importance for refugees to build bonds in their new homes. “One of the largest issues for many refugees is a feeling of isolation. They’re experiencing linguistic barriers, cultural barriers,” said Connors. The event was facilitated not just by Grace Farms, Full Court Peace and IICONN, but also by Cyrus Pearson, an 11-year-old New Canaan Country School student. “I love playing basketball, and some people don’t have the opportunity that I have. My friends were excited to do this with me,” Pearson said. “He also loves making new friends, and the court is such a natural place to do that because it doesn’t matter where you’re from,” Sarram added. Connors, Evans and Sarram discussed the possibility of running a week-long Peace in the Paint camp, but decided on a one-off because of logistical issues. But, Sarram said all parties are interested in running Peace in the Paint quarterly, and perhaps with girls next time. As the pick-up games wrapped on Tuesday, all the participants gathered and wrapped boxes were presented by the New Canaan players to their refugee teammates, who opened them to find new Wilson basketballs — a little something to remember their new friends by and to encourage them to get out on the court and play.